What's New For The 2019 GMC Sierra Model Review? Much has changed for the all-new 2019 GMC Sierra. Some of the most exciting changes come in the GMC Sierra Denali. This trim will feature chiseled shoulders and bold lines. The grille on the Denali is bigger and bolder than any previous Sierra. 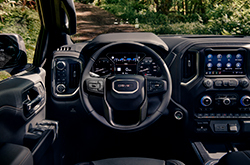 The cab in the new Sierra offers a higher driver's seat, giving you a commanding view of your surroundings. Everyone will be more comfortable in the 2019 Sierra, which features more legroom than ever. This is true for the front passenger and for those riding in the back. There are 6 different trims with 27 different configurations in the new Sierra. The available trims are Base, SLE, Elevation, SLT, AT4, and the much-anticipated Denali. Each of the trims can be a 4x2 or a 4x4, with the exception of the AT4, which comes only as a 4x4. You can comfortably seat 5 or 6 people in each of these full-size pickups. You can get your new Sierra in a wide range of colors. The Denali is available in 7, while the SLE is available in 13. The MultiPro tailgate is a first for the industry. It comes with six distinct features that make loading, unloading, and accessing the cargo box easier than ever. The rear bumper has a large CornerStep to help you jump into your truck bed with ease. You get high-intensity LED Lighting technology to help you see the path ahead. Drivers get an infotainment system that is quicker and easier to use than ever. It comes with an 8-inch diagonal touch-screen. There are downloadable in-vehicle apps as well as the ability to connect up to 2 devices at once. Your system can remember up to 10 devices. Optional features for the infotainment system include navigation and the ability to become a 4G LTE Wi-Fi® Hotspot. You have the option of having a wireless charging pad and a Bose Premium Sound System included. This vehicle is compatible with both Apple CarPlay and Android Auto. Drivers have the option of downloading the myGMC app, which allows you to do things like remote start your vehicle and send destinations through your smartphone. 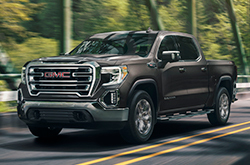 In your base trim of the 2019 Sierra, you will find a 285-hp, 4.3-liter V6 engine. This pairs well with the 6-speed automatic transmission w/OD and auto-manual. In both the SLE and Elevation, you get a 310-hp, 2.7-liter I-4 engine with an 8-speed automatic transmission w/OD and auto-manual. Finally, the SLT, AT4, and Denali all come with a 355-hp, 5.3-liter V-8 engine paired with an 8-speed automatic transmission w/OD and auto-manual. These are all gas-powered engines. The superior handling abilities of the GMC Sierra and available driver-assistance programs make this a very safe truck for you and your family. With the standard HD Rear-Vision Camera, the infotainment screen automatically shows what is going on behind your vehicle when you go in reverse. There are quite a few available safety options as well. They include IntelliBeam Headlamps, Forward Collision Alert, Lane Change Alert with Side Blind Zone Alert, Following Distance Indicator, Lane Keep Assist with Lane Departure Warning, Safety Alert Seat, Low-Speed Forward Automatic Braking, and Front and Rear Park Assist. For people with teenagers who will be driving soon, the built-in Teen Mode System allows you to set certain limits. It even offers a report-card to show you your teen's driving habits. 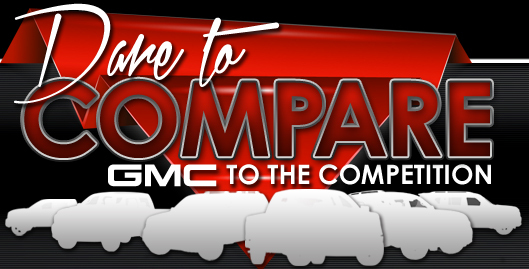 Come in to see us at our dealership in Lincoln and we'll be happy to answer any questions you may have about the 2019 GMC Sierra or to take a test drive.